Have you ever looked at Kim Kardashian and wondered how she looks A LOT like a modern-day Princess Jasmine from Aladdin? 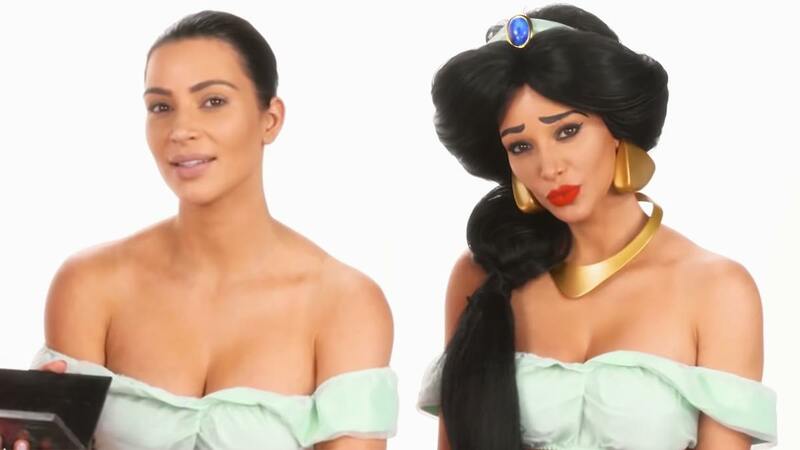 Well, makeup artist and YouTuber Kandee Johnson saw the similarities, too, and made our #KardashianXDisney collab dreams come true: She made Kimmie over into the famous ~Disney Princess~! To imitate Jasmine's "furrowed brow," Kandee glued Kim's kilay and applied concealer on top of it. The rest of the makeup consisted of neutral eyeshadow shades on the eyes, lots of eyeliner (Love this!!! ), contoured cheekbones and nose, and a coral-red lip! But of course, the look wouldn't be complete without Jasmine's signature long ponytail! And can we just say, when Kim wore it, we were shookt—Mrs. West, where are you? Watch the video below to see the full transformation!